Basil Garlic Popcorn literally couldn’t be easier. 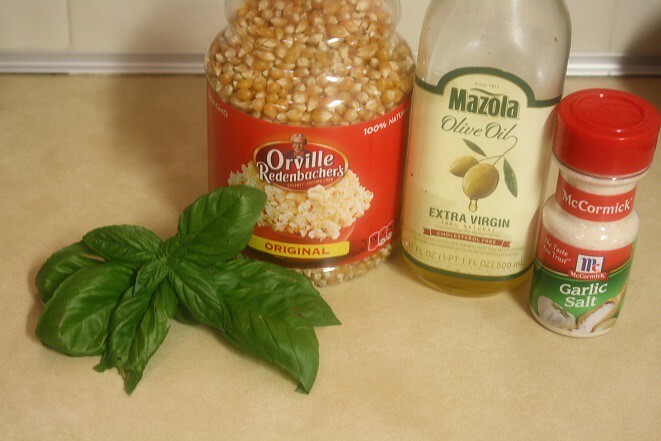 Here’s what you’ll need: Fresh Basil (a sprig or two so that you have about a tablespoon when chopped), Popcorn, Extra-Virgin Olive Oil, and Garlic Salt. Now cook up a batch of popcorn according to your popper’s instructions. 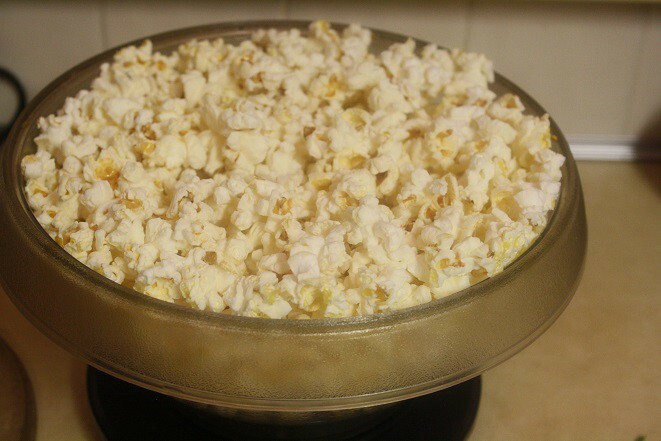 Here I am using about 1/3 cup of popcorn (aiming to get 7-8 cups of popped corn), with a little drizzle of olive oil. Cook in the microwave for about 2 minutes (or whatever your popper suggests). 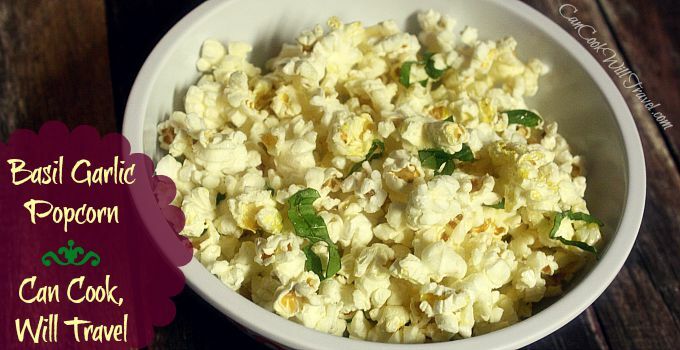 While the popcorn pops away, wash your basil leaves and pat them dry. Then chop them. The easiest way to do that is to stack the basil leaves on top of each other (discarding the stems), and then roll them up like a cigar. 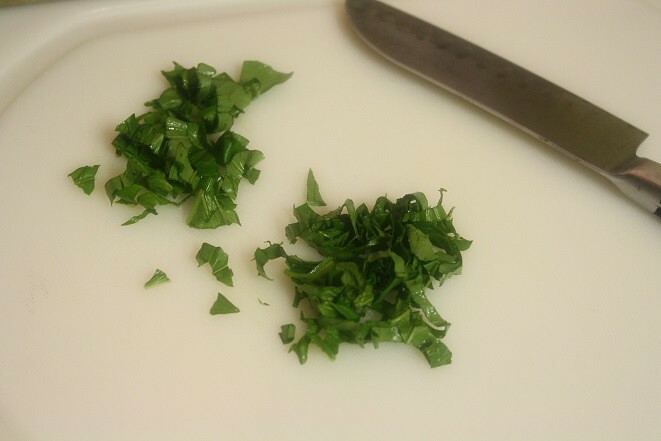 And then slice through the basil bundle and you get lovely strips of basil … this is called a chiffonade. Two short minutes later the popcorn was done and smelling totes amazing! Transfer the popcorn to a bowl, then add the chopped basil (at least a tablespoon), a teaspoon of garlic salt (I used slightly less than that), and 2-3 tablespoons of extra-virgin olive oil drizzled over the top. 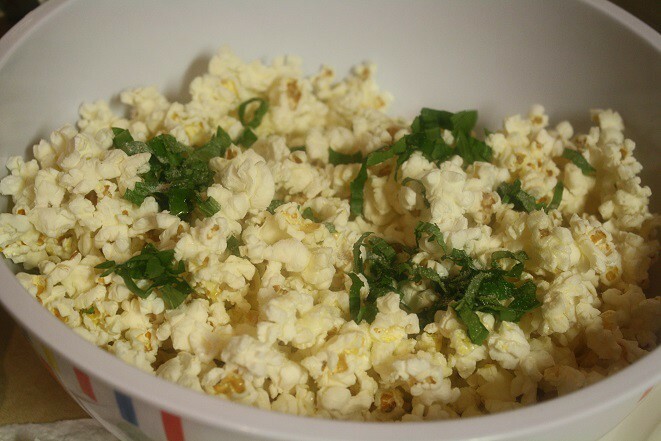 Grab a large spoon and stir until the popcorn is well mixed and you see the bits of basil throughout. That’s it! Serve up the popcorn and dig in! Be prepared for oohs, aahs, and some bowing by your friends and family. So light, Summer-y, and jam packed with flavor … it’s sure to be a hit! Happy popcorn-ing! 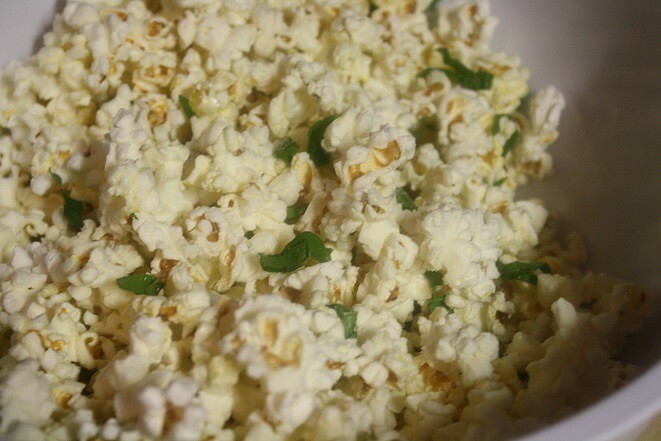 This super easy popcorn makes for a perfect snack that is crazy flavorful! While the popcorn is popping away, wash, dry, and chop your fresh basil. 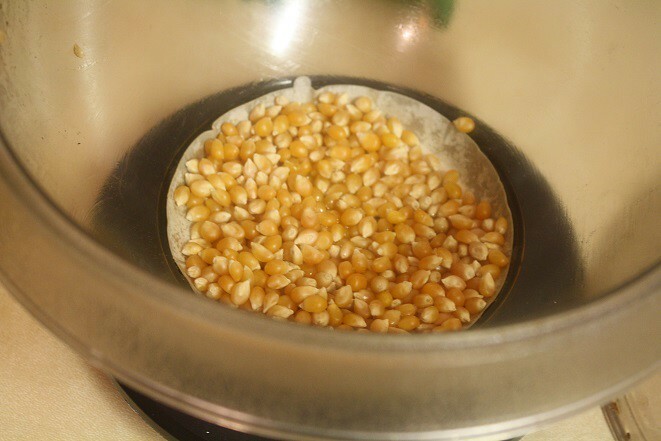 Once the popcorn is done, transfer it to a bowl (removing any unpopped kernels) and add the chopped basil, 1 teaspoon of garlic salt (you can add less here if you prefer), and 2 or 3 tablespoons of extra-virgin olive oil (totally up to you how much you want). Grab a large spoon and carefully stir the mixture until it's well combined and the basil is throughout. Serve it up right away and enjoy! !